If whales were as fond of me as they seem to be of this fisherman, I'd spend more time at sea! 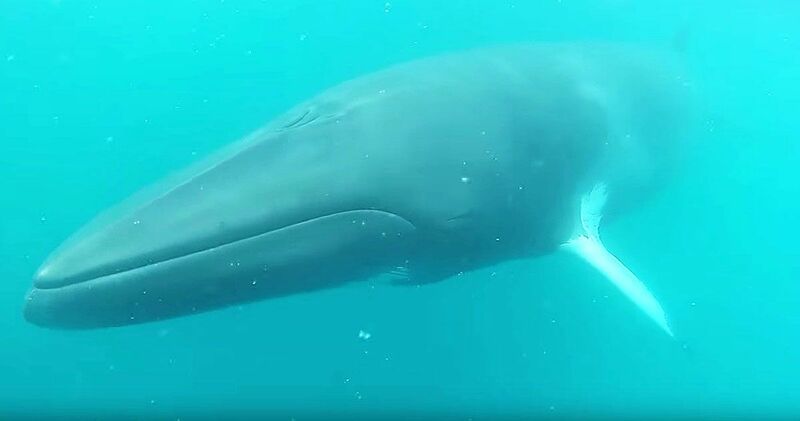 The video's producer reports that these friendly Minke whales swam around his boat for ten to twelve hours during his fishing expedition in the Indian ocean. After delighting viewers with a few teaser shots from the boat, our fisherman delivers the real treat: underwater footage of these gentle creatures. Minke whales are naturally curious and more likely to approach boats than other whale species. It is, however, uncommon for them to spend this much time so close to the surface. They clearly took a liking to this particular boat and its passengers! They are the smallest whales in their family, but they still measure up to thirty-three feet. The Minke whale is the most abundant baleen whale in the world. All baleen whales have long plates of baleen hanging from their upper jaw instead of teeth. These creatures feed on tiny organisms via a unique filter mechanism. Since they all eat the same things, they compete for food. Scientist think that the Minke whale avoided human capture for many years due to its size. Once larger baleen populations were depleted, this relatively small whale was more easily able to capture prey and flourished as a result. There are estimated to be roughly 800,000 baleen whales living wild in seas and oceans worldwide. Minke whales aren’t without predators. Killer whales have been known to feast on this smaller, more vulnerable species. The Japanese also have scientific permits to hunt 590 of these curious animals each year. Iceland and Norway also hunt a number of Minke whales each year. Though this particular species of whale is far from endangered and can easily shoulder the minimal human hunting that occurs, many activists argue that it is morally unacceptable to hunt any number of these intelligent animals for any reason.